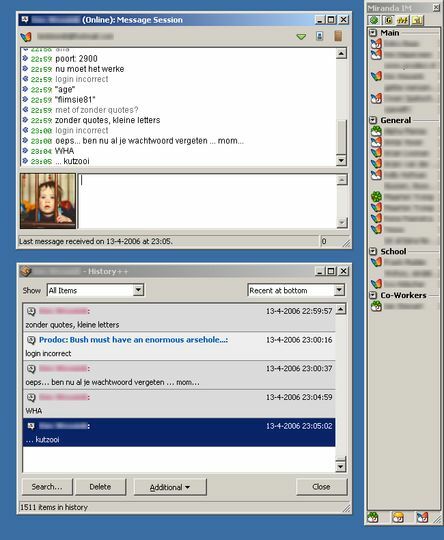 Miranda IM is a light-weight, open-source instant messenger that can connect to tons of IM networks, including ICQ, AIM, MSN, Jabber and Yahoo. In addition to IM networks, Miranda also supports IRC. Software supports all the basic features available on any IM nowadays, but its true beauty is in its range of plugins -- there are over 120 open-source plugins available for Miranda that extend its capabilities when necessary. Having said that, most users never need those plugins -- just like they don't need most of the features bundled with proprietary IM tools, such as MSN or AIM. 1License and operating system information is based on latest version of the software. If you do not have an AfterDawn.com accout yet, please enter a nickname and your email address below. We will send an account activation link to the email address you provide, so please make sure to use a valid address. Content will be published on site after you have activated your account. If you already have an AfterDawn.com account, please login using the next tab. Login by using your AfterDawn username or your email address. Is it doing Yahoo Conferences yet? 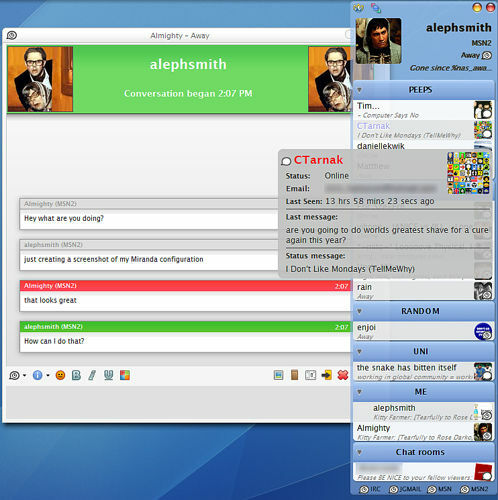 Miranda is indeed a very good and small chat client although it's not my main chat program because it is lacking in a few features like Yahoo Chat Rooms and the ability to turn off logging. I personally use this software and it is magnificent, i am sitll experimenting with its capabilities and it has not let me down, very fast, low memory imprint and overall great software. i will sure be using it from now on. Never had any issues installing or updating it, not sure what Wetchaser couldnt figure out, its a very basic install and works problem free here and on my other box. Do yourself a favor and give it a shot if you use one or more of the mainstream IM clients. Installed, imported msn list no problem. Could not get aim list imported. Said "connection failure, is aim open?" it was open. Think i got my icq list imported, not really sure as it does not really give a designation as to what program each name came from. Restarted computer...........Miranda was gone!!! No trace of it was found with windows search function!!! McAffie reported that its program now had missing files, and had to be re-installed. OMFG!!!! Did system restore, i think im ok now. DONT DOWNLOAD THIS JUNK.